As cyclists, we are vulnerable to any collision. A collision with a truck, bus, car, bicycle, pram, skateboard, rollerblader, pedestrian, dog, or even a domestic cat, will almost always cause a problem, if not an injury. Vehicle drivers are just people like us, except that they are in a comfortable safe box, maybe with crying kids in the back, and a have just dropped an ice-cream on their lap. You cannot expect them to be looking out for you all the time. So it's up to us to take 100% responsibility for our own safety. It doesn't help us if we were 100% in the right, but are 100% dead. Choose where you ride. Avoid high speed and congested roads. Statistics show that the probability of a collision rises rapidly after the speed difference between two road users exceeds 20 kph (12 mph). So choose paths without vehicle traffic, or roads with lower speed traffic. See How does the risk of a cyclist colliding with a vehicle vary with the speed difference? D'oh! I originally left out Ride where other people ride, or ride with a buddy. Drivers are much more likely to notice multiple riders. And when there is more than one of you it's not so easy to justify squeezing past. Finally, those drivers who might be tempted to drive dangerously close are intimidated by the you having a witness. Avoid turns in the middle of congested intersections. If you feel in danger, then ride at the side of the road across the intersection, wait for the lights to change, then continue on the crossroad. In my town this is called a square turn, in other places it's called a hook turn. Keep reasonably close to the curb, about half a meter (yard) to one meter out. You need to ride in a straight line so that the vehicle drivers can predict your path, so ride where the road surface is at least adequate. In light traffic, move toward the curb a little as the vehicle approaches and then resume your position after the vehicle passes. In heavier traffic, just maintain your path. Some cyclists like to have a mirror to know what's happening behind them. Traffic behaviour can vary in different parts of the world, so take your local traffic conditions into consideration. In my town, the inner city traffic is congested but used to seeing cyclists. So if there is no bike lane, cyclists are generally able to mix with the traffic fairly safely when the bikes are moving faster than the cars. Wear brightly colored clothing. In some parts of the world, black is fashionable. Avoid it. One advantage of a lot of so-called Lycra is that most of it is brightly colored. Some people wear hi-visibility industrial safety tops. Always ride with lights turned on. If legal, then set them to flash mode. Choose lights that flash more than once per second. Slow flashing lights can be missed as drivers shift their attention quickly. Some places (Germany?) forbid flashing bike lights. And stay alert. Listen for traffic. Don't rely on them seeing you. In some situations, you need to take a whole lane, so that the drivers behind don't drive too close by trying to squeeze past when there is not enough room. You should only do this when the traffic is moving at a similar speed to you. And as mentioned by mjsqu in comments, keep away from parked cars to avoid doors. It's all good, including the pages about trucks and buses. HTA 147 - Slow moving traffic travel on right side - any vehicle moving slower than the normal traffic speed should drive in the right-hand lane, or as close as practicable to the right edge of the road except when preparing to turn left or when passing another vehicle. For cyclists, you must ride far enough out from the curb to maintain a straight line, clear of sewer grates, debris, potholes, and parked car doors. You may occupy any part of a lane when your safety warrants it. Never compromise your safety for the convenience of a motorist behind you. I general I assume that drivers are looking forward (out of their windscreen) but never assume that they're looking out their side window. 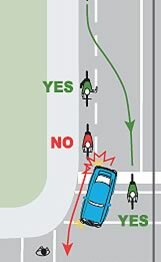 Also if I'm coming to an intersection where I have right of way (the other driver has a stop sign) then I watch for eye contact with the driver: if I have seen that they have seen me then I'm willing to cycle across their bow, otherwise (e.g. if they're looking in another direction) I might slow down, in case they pull out without having seen me, until they do look at me. I'll try to stay out of the way (preferring roads which have an official bike lane, or a road that's wide enough for me to ride in the curb) where cars can overtake me safely. If cars can't overtake me safely (because the road is too narrow) then I take the lane in order to prevent cars from even trying to overtake. I also try to ride fast enough that my doing this doesn't annoy drivers. I can't match their top speed but my acceleration (in congested city driving) is comparable. If the rate of flow of traffic on a given street is limited by the buses or streetcars then I can keep up with (even overtake) them, so even when I'm in lane I'm not 'getting in the way' of drivers (because I'm keeping up with the vehicle ahead of me). I use lights at night, and hand-signals before turning (and, sometimes, when slowing). I keep an ear out for traffic (and I avoid, e.g. by pulling into the curb/kerb, people who are gunning their engines). Obviously I watch what's ahead but (moreso than when driving a car) I watch for what's behind and beside me. I have excellent brakes (hydraulic disk brakes) and I'm willing to use them. I avoid roads on which bikes are unexpected (e.g. a type of multi-lane city throughway whose top speed is 60 kph instead of the more usual 50 kph). In the long term, you can also lobby and campaign for better cycling provision. The personal safety advice (better visibility etc.) is all valuable, but there is only so much you can do when a junction s poorly designed and creates conflict between different road users. Basically, if you feel unsafe on the road, then the road needs to be designed better. Lobbying for better cycle lanes will of course not make cycling safer or more pleasant immediately, but there is a good chance you will see improvements over the years. In Edinburgh (where I live) we've seen huge steps forward, both in quantity and quality of cycle provision, thanks to very substantial and constructive campaigning by various groups, and by now almost all local councillors are publicly in favour of supporting cycling as sustainable transport that solves a lot of inner-city problems (congestion, noise, pollution, health etc.). Cycling into town feels significantly safer and more comfortable now than it did just five years ago. Write to your local politician and/or to the roads authorities arguing (politely) for improvements. It works best if you can be specific, e.g. explain the situation at a particular junction where you have most difficulties with other traffic. Road authorities often have public consultations before roadworks or road redesigns. Take part, look at the plans, go to consultation events and comment if you feel that cyclists haven't been considered enough. Join a local or national campaign group for better cycling provision; there are more and more popping up all over the world. They are aware of local developments and often have a lot of expertise on road design etc. Even if you don't have the time to become active yourself, just being a supporting member lends weight to their work. Campaigning can be quite frustrating as you'll get a lot of opposition against your suggestions, but even if you don't see immediate results it will put cycling on the agenda and politicians become aware that the current situation is not good enough. Be visible, be predictable (e.g. obey the rules, give hand signs, avoid sudden turns or braking) and leave a safety margin for the errors of others (e.g. don’t ride too close to parked cars). Personally I prefer riding on roads like any other vehicle and with quite a bit of distance to the curb. Edit: I forgot “be attentive”. E.g. Look over your shoulder when doing a left turn. I’ve been overtaken on occasion despite indicating with my fully outstretched arm. this is a question I've given a great deal of thought and experimentation to, after an accidental discovery some years ago. Long story short: cycle where the kerb-side wheel of a car or truck would be, and magically, Jedi-mind-trickily, almost ALL drivers give you plenty of room when passing, wait patiently to pass, and are not in the slightest bit annoyed. I know -it's like suddenly a population of saints take over all the vehicles. I know it seems unbelievable, but please try it yourself. If you go closer to the kerb, vehicles will "buzz" you close (like you're not there at all), if you go closer to the center-line you'll get cursing and beeping (as you're in the way), but if you track where the kerb-side wheel of a travelling vehicle "naturally goes" just see what happens. I call it the Goldilocks zone. I'd love for some University to formally test this - as I say, I did it by mistake one day (day-dreaming in a narrow lane doh!) and have experimented over many years in many different environments (city, suburb, open country) and it darn near ALWAYS works. Go figure! Be visible. During the day, this means bright-colored clothing. At night, lights and broad retro-reflector stripes. Urban camouflage may be fashionable, but it's also a good way to keep drivers from seeing you. Be predictable. Because you are one of the slowest vehicles on the road, everyone else is reacting to you. Make it easy for them: stay in the same lane and the same part of the lane as much as possible, and signal your maneuvers well in advance. Follow the law. This goes hand-in-hand with being predictable: those stop signs, red lights, and direction-of-travel laws apply to you just as much to a car. If you can't go a respectable fraction of the speed limit, stay off the road. Most cars have a minimum practical speed (typically around 15 km/h - 10 mph), and if someone is constantly tapping their brakes to keep from rear-ending you, that's not a safe situation. When hand-signaling, wave your hand a little, or even raise and lower your arm a couple times. I believe it triggers an instinctive response in people who see that in their peripheral vision ("Ooh! Who's that waving at me? Do I know this person? "), and they notice me far more often. As cars are approaching, and are still well behind you, turn your head to look back. Again, I believe it triggers that same instinctive response. If you live in a region where riding with blinking lights is illegal, encourage every local cycling group to lobby for a change to that law. It's stupid, and only creates a higher risk of collision. Obviously don't ride at night with blinking headlights, but always use a blinking taillight. But in the daytime, if allowed, do it 100% of the time. Get bright lights! Most cheaper lights just don't attract enough attention. When using a bike lane, hug the line until vehicles are near you, then fade toward the curb as they're passing (if you won't get doored), just as you would do on roads without bike lanes. Get some hi-vis stickers and apply them to different areas of your bike. Under vehicle headlights, they're as visible as bike lights. When taking the lane, ride in front of the driver's position to increase your odds of being seen. I've followed these guidelines for the past six years without incident, on an asphalt-grey bike with black fenders, and without wearing any bright clothing (not that brighter clothing is unnecessary - just not my style). Be assertive. If you need to take up a whole lane take up a whole lane, you have as many rights (in the UK at least) as cars. It will annoy drivers, but I'd rather someone shouted abuse at me as they drove past than have someone hit me because they couldn't see me. Also stay 2-3 feet out from the pavement/sidewalk and parked cars. This will make cars slow down to get round you instead of squeezing through a small gap, and if they try to squeeze past you have enough space to dive into. Also as everyone else says, be predictable, follow the rules, be visible and be sensible. Doesn't matter if you're in the right you are always coming second in a collision with a car. US rider so these may not apply to everyone. First know your local laws. There are some state laws and many city or county laws. Know them and know what to expect. Some of these suggestions may not work for you in your area. Wear visable clothing. This usually doesn't need to include "parking cone orange" but, stay away from "urban camo" as well. Normal, non-dark clothing should do fine. 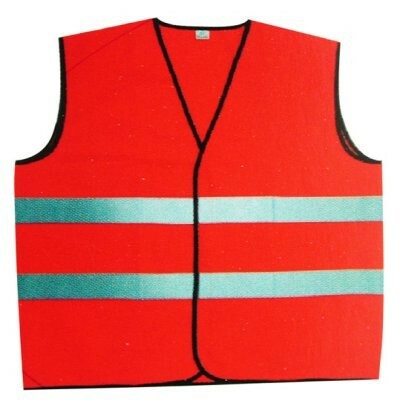 Many lines of active ware come with a reflective or brightly colored stripe. Those will do just fine. Get a head light and tale light and use them in less sunny conditions. You don't need them, and the won't do much an a sunny summer day at noon, but as the sun starts to go down and you gen near the dusk hours they can be the best things ever for visibility. Setting your headlight to always on, and pointing it at the ground is good (in combinations with other tips here). Your tail light should be on annoying blink mode. Unless you have no choice, do not ride at night. Pretend your a car. Seriously. You are given the same rights as a car, and the same responsibilities. If you get into an accident the law will treat you as a vehicle. Know the area. Know where the bike lanes are, where the wide shoulders are, and where the tight fits are. Be prepared to do different things in different sections of road. Be predictable. Follow the laws of the road, just like you were in a car. Stop at stop signs, yield at right turns, and follow the order of "who goes next" at non-lighted intersections. Being predictable is very important. STAY OFF THE SIDE WALK You are going way to fast to have to dodge people. TRAVEL WITH TRAFFIC I have no idea why it became popular to travel against traffic, but don't, just don't. It's illegal, it's dangerous, and it's nearly impossible to see you when turning. Get to the correct side of the road. Don't ride next to parked cars. Just don't. Move over, away from the parking lane, far enough that if a door swings out in front of you, you can not be hit by it. This means you may have to pass up riding in the bike lane. That is ok. There is noting illegal about not using the bike lane. When at an intersection. Do not "pass" the first car. Sit behind the first car. It's ok to move up the 40 other stationary cars, but sit between the first car and the second. This will increase your visibility. When turning right, sit to the right side of the middle of the right lane. A car should not be able to go around you on either side. When turning left , sit to the left side of the middle of the lane. A car should not be able to go around you. When traveling down a road with no wide shoulder and no bike lane, ride in the middle of the right side if the right most lane. A car should have to switch lanes to go around you (or at least move into the next lane). Plus if they are too close, you have plenty of room to move. When traveling down a road with a bike lane. Move out of the lane (between the first and second car if you can) at stops. Make sure to honor the stop lights and again the basic idea it to make traffic have to deal with you. Do not travel on roads where you can't reasonably "keep up". For example if you can do 8 MPH then stay to residential roads where the speed limit is around 25 MPH. Don't do 8 MPH in the middle of a 60 MPH road. If you can to 20 MPH then road marked as 45 MPH are probably ok. The general idea is that traffic should be able to flow around you without backing up entire spans of traffic. Finally, disregard every one of these rules where your safety is in concern. For example, it may be better to go one block, up a sidewalk, the wrong way, then to try to make an awkward left turn. Pedestrians which may not look on the road when crossing and are not on the road initially. Parked cars, which could open there door at any moment. Assume this will happen to all parked cars. Ride outside the door zone even if it means not riding on the far right of the road. Hazard in the road including pot holes, debris, puddles, etc. Threats can come from anywhere at any time on or off the road. When I am riding my bike in the city I am about as focused as I ever am, constantly scanning for things that may injure me. At traffic lights, take your spot in line behind a car. If there are hazards on the side of the road like debris or parked car (maybe not ride in the middle but dont ride on the edge of the lane). Additionally you should have good brakes so you can stop if you suddenly need to. Infact, a well mantained bicycle is very important for your safety. If your tires are dry rotted, maybe they will burst while you are riding. If the chain breaks while you are pedaling hard you could fall. If your bike is too small for you, you could become off balanced while pedaling and fall (this happened to me once and it was a nasty wipeout). Large pedals can also be helpful for keeping your grip. Get your country to invest in proper infrastructure. Maybe the best site in the world about cycling infrastructure is A view from the cycle path, and this link gives you the page on what to copy when building infrastructure. The Netherlands sets the best example, but don't copy anything just because it is "Dutch". While Germany is a genuine leader in renewable energy, and Danish design is known across the world, it is the Netherlands that should be looked to as the leader in cycling. Added: I see from the downvotes that people do not like my solution, but there is proof, and plenty of it, that it is the best and only real working solution. Read the site I linked to for many more arguments and proof. Eyes - look straight at the driver and hold the gaze until they see you. Human brains are wired to detect and pick out eyes/eyeballs in the visual field. Try it - as a cyclist you can see clearly when the driver/other cyclist notices you. And if they still don't see you, it gives a split second more warning to react appropriately before they pull out.... enough time for a flash glance behind, or to prepare yourself for impact. NYC - here is a city I was not safe crossing the street in. Drivers deliberately aimed for me many times and my car experienced many hit and runs where I had to drive after the perpetrator to get his license plate. This was a place where parking a bike for more than a couple of hours meant losing your bike to thieves regardless of how many U locks you had on it. I mean, if you can not walk there, drive there, park there, how can you bike there safely? Las Vegas - here is a city where twice drivers pulled onto the sidewalk to try and get me, one continued to follow me down the sidewalk. I had 3 bikes stolen there and one time was mugged while riding in front of a famous hotel when they hit me with pipe as they passed in their car. My Mother was hit while she was crossing the street and he never stopped. A case happened in my neighborhood, kid was on his bike, got run over, guy did not stop, went home and ate a big dinner while that kid died. If a guy would eat dinner after running over a child and say pass the gravy, is it safe to bike there in traffic? Let us face it, many motorists really hate pedestrians and cyclists. Motorists act like vicious psychopaths. It is nothing more than bullying, they weigh 3000 pounds plus and you weigh 200 or 250. They are driving out their right now, never been caught and they never will be. I have been biking for 60 years on and off and have never seen any change in their attitude. I solved the problem by not cycling in places like the above. I moved to a small town where now when I cycle down a road I am the only thing on it. I ride the sidewalks and streets in peace. People park their bikes and run into a store and do not even lock their bike up! I put a 10 dollar chain on mine. As Mel Brooks said,"location, location, location." Some will say this does not answer the question of increasing visibility. I say they see us just fine, they do not care. Wear a full Batman suit with a night reflective cape. The Batman suit should offer good visibility for the person wearing the suit, will have a cool cape that flaps in the wind, and has places to put all those gadgets so you don't have to have them in your ears and eyes. I don't bicycle on the road anymore but as a driver you can bet I'll be staring down both the rider and the bicycle as I drive by if I see Batman. Any of the ideas in this thread that increase the chances of eye contact will help you as it is harder to ignore somebody who has made eye contact. - So if Batman is not your style, perhaps giant cookie monster eyes on the back of your helmet will work for you. Not the answer you're looking for? Browse other questions tagged safety traffic or ask your own question. Nearly getting hit by reckless vehicles. What can be done? Cyclist vs Van. Who is wrong in this scenario? What statutes govern the directing of traffic by citizens in Massachusetts? What is the best way to stop and restart at a stoplight?